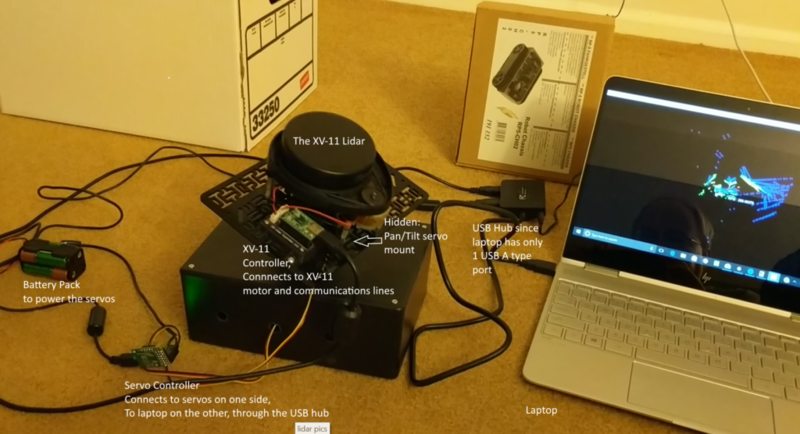 It’s been over two years since I first wrote about lidar units, and at the time I stated I wrote that the final part would be a look at the Neato XV-11 that I had purchased off of Ebay. That got delayed by several years, first due to an initially bad unit (but great response from the seller to correct the problem! ), then higher priority projects and life intervened, but I’m finally ready to report. Besides playing around with the unit, I added some enhancements to the display software available from Surreal, who make the controller unit I used, and mounted the lidar on an pan-tilt system so I could do 3D scans. Construction is really straight-forward. 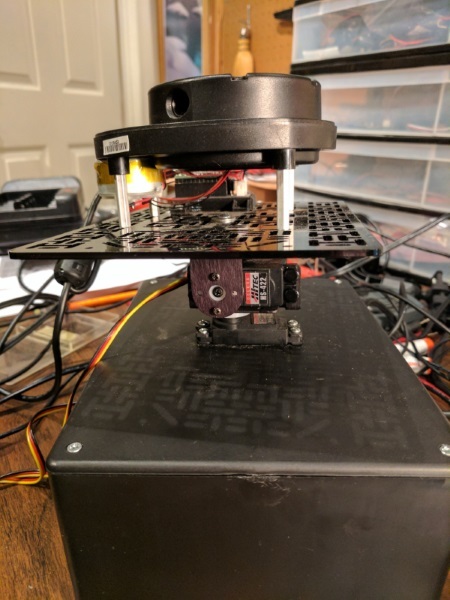 I mounted the lidar to a plastic base plate using some standoffs (since the drive motor sticks out underneath the unit). Then I mounted the base plate to the pan-tilt system, and mounted that to a project box I had lying around. The XV Lidar Controller version I used is built around a Teensy 2.0 and uses PID to monitor and control the rotation speed of the Lidar, controlling it with PWM. 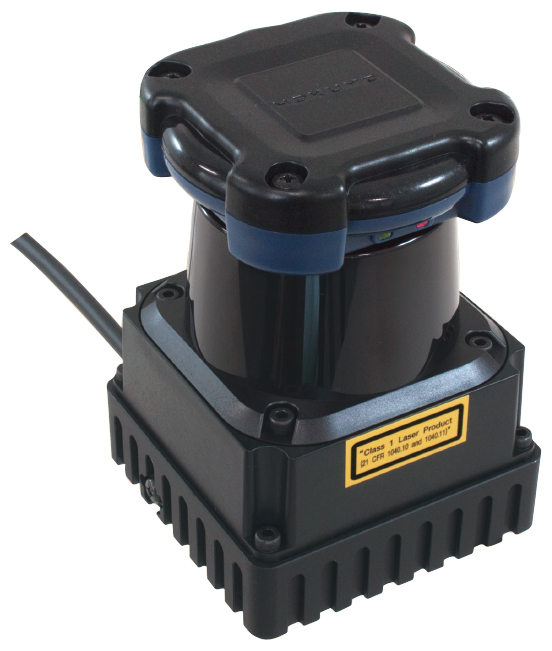 In addition, it reads the data coming off the lidar unit and makes the information available through a USB port. I didn’t touch the firmware for the lidar controller. The source code is available through links at Surreal’s site. There are several very similar versions of visualization code in python that takes the output from the lidar controller and displays it using VPython. They all seem to start from code from Nicolas Saugnier (Xevel). I started with one of those variants. The main changes I made were 1) to add the ability to do a 3D scan by sweeping a pan/tilt mount through various pre-set pan and tilt angles and 2) to add the ability to capture and store the point cloud data for future use. In addition, I wrote a routine to then open and display the captured data using a similar interface. Additional smaller changes were made such as implementing several additional user controls and moving from the thread to the threading module. The pan-tilt setup does not rotate the lidar around the centerpoint of itself. Therefore, in order to calculate the coordinate transformation from the lidar frame of reference to the original non-moving frame you have to do both a coordinate rotation and an angle-dependent translation of the origin. This is handled by the rotation.py routine using a rotation matrix and offset adjustments. The servos are controlled through a servo controller, with the controlling software (altMaestro.py) being an enhanced version of the python control software available through Pololu that was originally developed by Juhapekka Piiroinen and Brian Wu. My version corrects some comments which were inconsistent with actual implementation, fixed bugs in the set_speed routine, and added “is_moving” as a API interface to be able to check whether or not each individual servo was moving. The point cloud data is stored in a simple csv file with column headings. Each row has the x, y, and z coordinates, as well as the intensity value for the returned data point (provided by the XV-11), and a flag that is set to 1 if the XV-11 has declared that the intensity is lower than would normally be expected given the range. When displaying the results, either during a scan or from a file, the user can select to color code the display by intensity, by height of the point (the z value), or by neither. In the latter case, points with the warning flag set are shown in red. 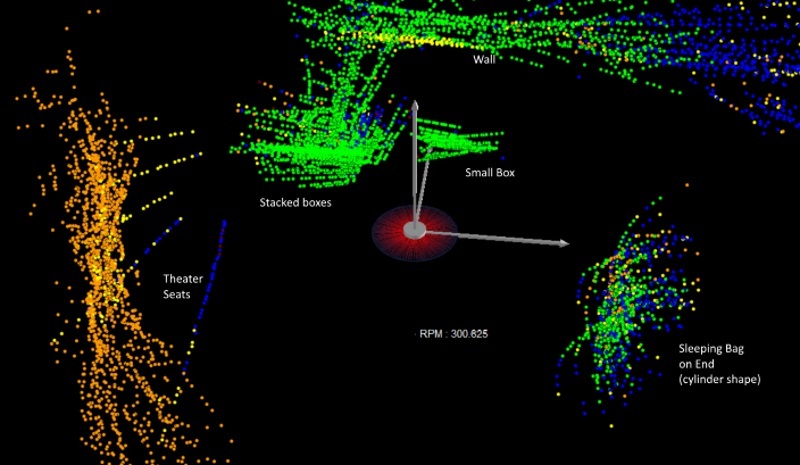 In addition, as in the original software, the user can toggle showing lines from the lidar out to each data point and also an outer line connecting the points. The software, along with some sample point cloud files, can be found on my Neato-XV-Lidar-Tools repository on GitHub. 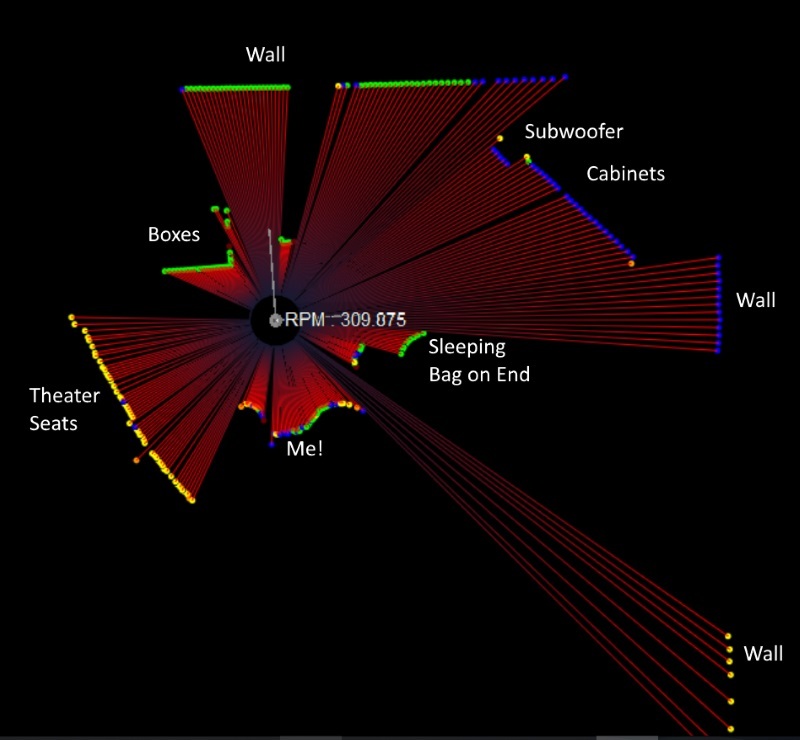 The original visualization code was written for Python 2.x and for VPython 2.6 or earlier. After some deliberation, I decided not to update this. Post version 6, VPython internals have been entirely redone, with some minor changes to how things are coded. However VPython 7 currently has issues with Spyder, that I use as my development environment, while VPython 6 won’t run in Python 3.x, and never will. It shouldn’t be a hard lift to convert the code, but note that if you update it to run under Python 3 you’ll also need to update to VPython 7 or later, while updating VPython alone may create issues depending upon your development environment. So it’s best to make both updates at the same time. 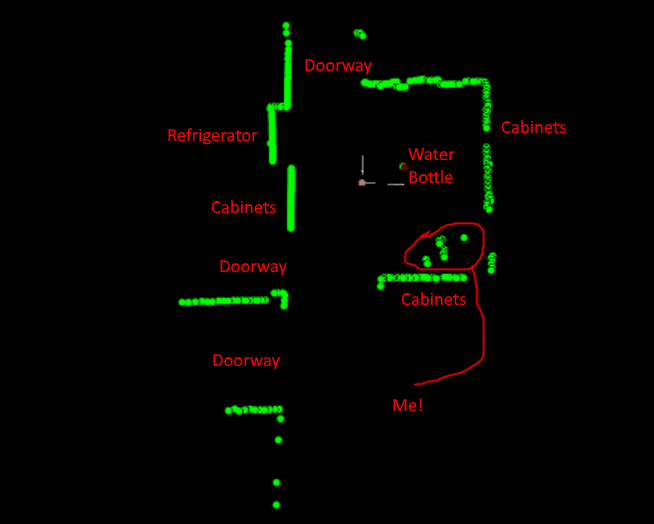 This first scan is a 2D scan from the floor of my kitchen, with annotation added. It clearly shows the walls and cabinets, as well as the doorways. Note that the 2nd doorway from the bottom is to a stairway to the basement. Clearly either a 3D scan or an additional sensor would be needed to keep a robot using the lidar from falling down the stairs, which the lidar just sees as an opening at it’s level! The display options also allow you to color code the data points based on either their intensity or their height off the ground. Examples of the same scene using these two options are shown below. In the intensity scan, you can see that nearby objects, as a general rule, show green (highest intensity), however the brown leather of my theater seats do not reflect well, and hence they appear in orange, even though they aren’t very far away from the lidar unit. Even after calibrating the pan and tilt angles the alignment is not perfect. This is most clearly seen by rotating the view to give a top/down view and noting that the lines for vertical surfaces do not all overlap on the display. The 3D results weren’t as good as I’d hoped, but it certainly works as a proof of concept. The 2D results are very good, given the price of the unit, and I could envision modifying the code to, for example rapidly capture snapshots and use the code to train a machine learning program. One clear shortcoming in the current implementation is the need to carefully calibrate the servo command values and the angles. This takes some trial and error, and is not 100% repeatable. In addition, one has to take into account the fact that as the unit tilts, the central origin point of the lidar moves, and where it moves to is also a function of the pan angle. One of the effects of this setup is that unlike an expensive multi-laser scanning unit, each 360 degree scan is an arc from low to high to low, rather than covering a fixed elevation angle from horizontal. This makes the output harder to interpret visually. The 3D scanning kit from Sweep takes a different approach, rotating the lidar unit 90 degrees, so that it scans vertically rather than horizontally, and then uses a single stepper motor to rotate the unit through 360 degrees. Both the use of a single rotation axis and the use of a stepper motor rather than a servo likely increase the precision. 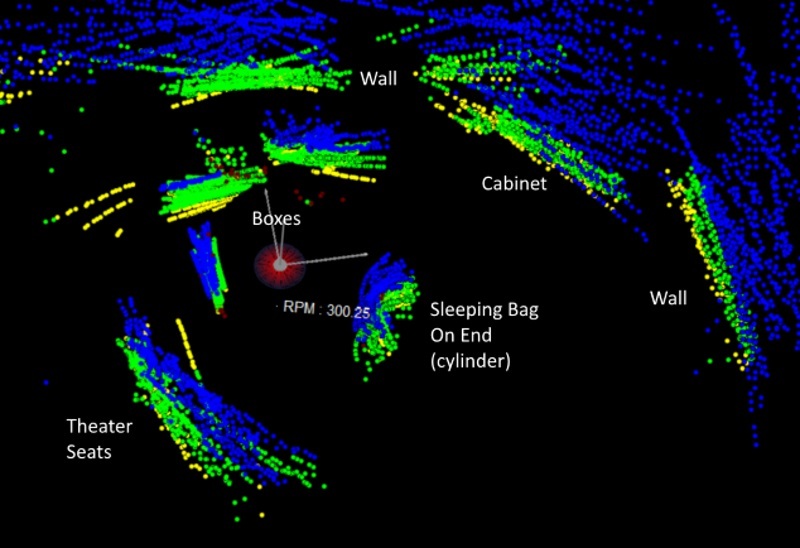 With either 2D or 3D scanning, the lidar can be used indoors as a sensor for mobile robots (as that’s what it was used for originally, after all). There’s an interesting blog post about using this lidar unit for Simultaneous Location And Mapping (SLAM). I may try mounting the lidar and a Raspberry Pi on a mobile robot and give that a try. When I wrote my previous posts on Lidar units, the cheapest 360 degree scanning unit that was suitable for outdoor use cost over $1,000. While both Velodyne and Quanergy have promised sub $1,000 solid-state automotive grade lidar units (at least if bought in automotive industry quantities) within the next 12 months, in the meantime, hobbyists now have the Scanse Sweep. This unit uses the previously reported on LIDAR-Lite as it’s core lidar unit. The specs state that it has a range of 40 meters, a resolution of 1cm, and that because it uses coded signals, it works outdoors as well as indoors. The price, as of today, is $349. This is higher than its original price when launched, which is likely driven by the fact that the cost of LIDAR-Lite units have gone up since it’s come back into production by it’s new owner, Garmin. 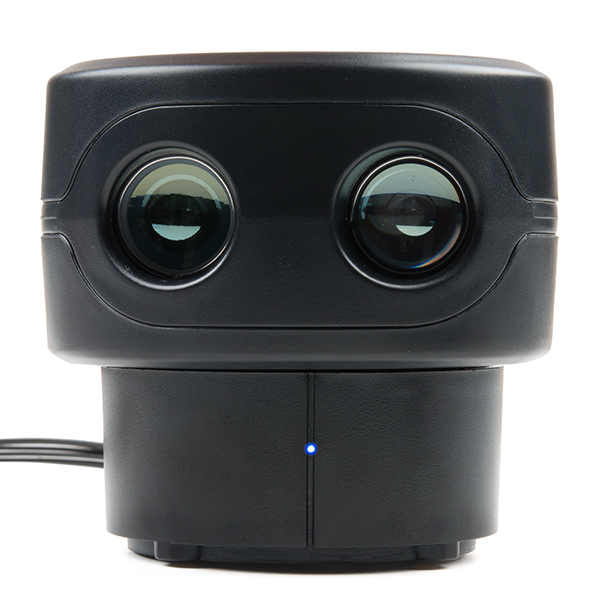 The LIDAR-Lite v3 itself has a list price of $149.59. While certainly not an automotive great sensor, the Scanse Sweep looks like a good product for outdoor as well as indoor projects, including scale vehicle projects, at an affordable price. Part 1 of this series discussed the sub-$500 XV-11 and RPLIDAR units that are available at the lowest end of the price range. This part of the series discusses lidar units in the $1,000 – $10,000 range. Part 3 will conclude the series with a hands on look at the NV-11, once I’ve received the one I’ve ordered and have had a chance to explore its use. $1,000 – $10,000 is out of reach for most individual hobbyists, but not unreasonable for a team project or not-particularly well-funded research team. 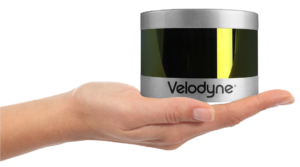 In this price range, you get upper end low-range devices intended for indoor use, but you also move into devices with much longer ranges, intended for indoor or outdoor use, and the recently announced Velodyne Puck provides a new level of performance for a lidar costing less than $10,000. 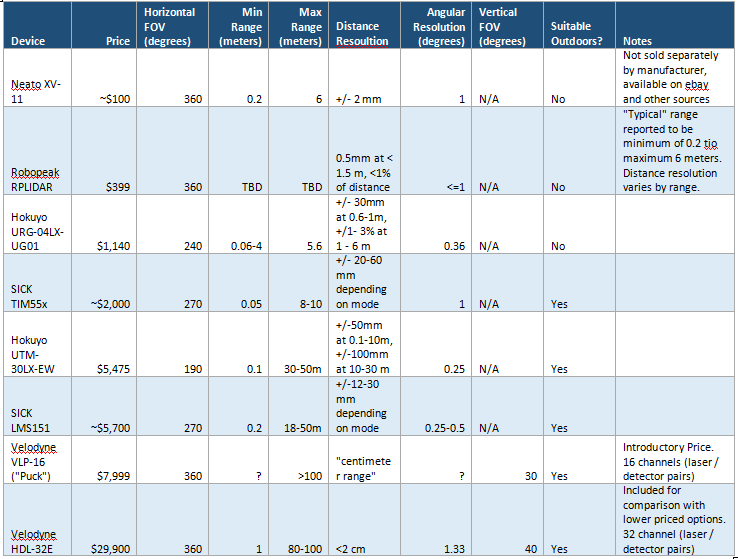 The chart below, drawn from multiple sources on the web, provides some of the key performance characteristics for $100 – $8,000 lidar units described in the article. Also included for comparison is a $29,900 unit. There are additional factors to consider when purchasing a lidar unit. The purpose of the chart is to give an idea of what performance is available at what price points. If you have less than $1,000, you can get a 2D scanning lidar unit for indoor use with limited range (up to about 6 meters). The lidar will use triangulation rather than time of flight to determine distance. However, the performance appears to rival that of units costing over $1,100, so if you only need a short-range indoor unit, a Neato XV-11 or RPLIDAR is worth considering. the extra cost of the RPLIDAR gets software and support. The XV-11 is only available from resellers who get them from Neato robotic vacuum cleaners. While not supported by the manufacturer, the community had developed drivers, interfaces, and other software for this unit. If you’re looking for something with a longer range and/or for outdoor use, you’re going to need to spend at least $2,000. In the $2,000 – $6,000 price range you’ll find units rated for outdoor use, with maximum ranges between 8 and 50 meters. These will be 2D scanning units that use time of flight to measure distance. Some of these units can process multiple returns from each pulse, giving an indication, for example, of the height of vegetation if measured from above. Up until very recently, if you wanted to take the next step up to a 3D scanning, long range, outdoor unit, you needed about $30,000. However the newly announced Velodyne VLP-16, aka, Velodyne Puck will deliver this level of performance at under $8,000. It has 16 channels to scan a 30 degree vertical field of view with each rotation and covers a full 360 degrees. While not as capable as the Velodyne HDL-32E, included in the above chart for comparison, it is the first multi-channel, 3D scanning, long-range lidar available for less than $10,000. While not as capable as the higher end unit, it also costs less than 1/3rd the price. It will be interesting to see if automated passenger car researchers can utilize this new, lower cost unit. Part 3 will describe my experience with an XV-11 unit, once it arrives and I have a chance to play around with it.